Differences of opinion don’t destroy relationships – it’s how a couple deals with their inevitable differences that counts. Every couple disagrees from time to time. Perfect compatibility is not possible, but sensibly working though incompatibility is. The difference between a happy couple and an unhappy couple is the way in which they handle their disagreements. Thus, in order to grow and be successful in our intimate relationships, we must adopt healthy coping strategies for dealing with our differences. Talk to any set of grandparents (or great-grandparents) whose relationship has withstood the tests of time, and they will tell you that the best relationships are not just about the good times you share, they’re also about the obstacles you go through together, the disagreements you compromise on, and the fact that you still say “I love you” in the end. And loving someone isn’t just about saying it every day, it’s about showing it every day through actions and behaviors, even when you and your partner aren’t seeing things eye to eye. 1. They both take responsibility. When you deny responsibility in every relationship disagreement, all you’re really doing is blaming your partner. You’re saying, in effect, “The problem is never me, it’s always you.” This denial of responsibility just escalates the argument, because there’s a complete breakdown of communication. So take responsibility for your actions. Take responsibility for your relationship – the good times and the bad. Work with your partner. Communicate. Blaming them is a copout that accomplishes nothing. Either you both take equal ownership of the problems you two encounter together, or the problems will own both of you. 2. They are committed to dealing with disagreements, positively. Often it can be easiest to run from a disagreement, especially if you’re not a confrontational person by nature. But remember, this isn’t about you or whether or not you feel like dealing with your differences. It’s about what your relationship needs in order to grow and thrive in the long run; so put these needs ahead of your own. Both partners must be committed to dealing with their disagreements, because running from them will only make matters more difficult to deal with down the road. One of the most effective tools couples can use to ease the process of dealing with disagreements is using positive language. Relationships flourish when both people are able to share their innermost feelings and thoughts in a positive way. One effective method of doing this during an argument is to do your best to avoid using the word “you” and try to use the word “I” instead. This makes it much easier to express feelings and much harder to inadvertently attack the other person. So… Instead of saying, “You are wrong,” try saying, “I don’t understand.” Instead of telling them, “You always…” try saying “I often feel…” It’s a subtle shift that can make a dig difference. 3. They attack their disagreements, not each other. Even when it’s hard to think clearly in the heat of the moment, you have to take a deep breath and remember that your partner is on your team. Always support one another, even when you don’t see eye to eye. Don’t take your stress out on the each other. Keep your focus on the problematic disagreement and attack it together by talking it out and reaching a compromise. 4. They practice intentional communication. 5. They let each other save face. My grandmother once told me, “When somebody backs themselves into a corner, look the other way until they get themselves out; and then act as though it never happened.” Allowing your partner to save face in this way, and not reminding them of what they already know is not their most intelligent behavior, is an act of great kindness. This is possible when you realize that your partner behaves in such ways because they are in a place of momentary suffering. They react to their own thoughts and feelings and their behavior often has nothing directly to do with you. At some point we all inevitably have unreasonable mood swings. We all have bad days. Giving your partner the space to save face, and not taking things personally when they’re occasionally upset, cranky or having a bad day is a priceless gift. Even if you are unquestionably right and your partner is unquestionably wrong, when emotions are flying high and you force them to lose face, you’re simply bruising their ego. You’re accomplishing nothing but diminishing their own worth in their own eyes. Do your best to let your partner preserve their dignity. Give them space, let the emotions settle, and then have a rational conversation using the positive communication tactics discussed above in point #2. 6. They are willing to make sacrifices for each other. The happiest intimate bonds are tied with true love, and true love involves attention, awareness, discipline, effort and being able to care about someone and sacrifice for them, continuously, in countless petty, little, unsexy ways every day. You put your arms around them and love them regardless, even when they’re not seeing things your way. And of course they do the same for you. If you really want to know what a happy, healthy relationship is, it’s one where two people wake up every morning and say, “This is worth it. You are worth it. I am happy you are in my life.” It’s about true sacrifice. It’s about knowing that some days you will have to do things you dislike to make the one you love smile, and feeling perfectly delighted to do so. 7. They expect to disagree with each other on some things, and they’re OK with it. Again, differences of opinion (even major ones) don’t destroy relationships – it’s how a couple deals with their inevitable differences that counts. Some couples waste years trying to change each other’s mind, but this can’t always be done, because many of their disagreements are rooted in fundamental differences of opinion, personality or values. By fighting over these deep-seated differences, all they succeed in doing is wasting their time and running their relationship into the ground. So how do healthy, happy couples deal with disagreements that can’t be resolved? Which point resonated the most with you? What else would you add to this list? Do you have any personal experiences or stories to share? We would love to hear from you. Please leave a comment below and share your thoughts with the community. Excellent advice! Like most of the articles from your blog and book, these points resonate deeply. My husband and I have been married for 39 years, and I think too many couples these days give up on each other far too easily — as soon as there is a bump in the road, they break things off. With that said, these changes have to come from both sides of the relationship — if one partner always thinks he/she is right it is unfair to expect the other to constantly back down. But when both partners are committed to these principles, relationships last and grow in beautiful way. Well said, Mara. It absolutely takes two. 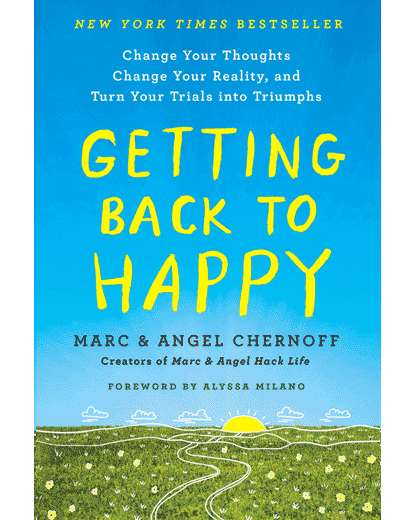 I too have learned so much about life and about myself by reading Marc and Angel’s blog/emails/book and others with important marital advice. The first 3 points in this post are crucial for couples. One of the things I’ve come to understand in my 26 years of marriage is that it’s easy to point fingers and hard to take responsibility. In most cases bad arguments and disagreements take two. If you aren’t proud of your own behavior then stop worrying about what your partner is doing wrong and work on improving yourself first. Then, once you are calm, carry out a productive conversation. Kevin, as I’ve told Mara above, I completely agree. A healthy, happy relationship takes two people who are committed to being their best as individuals, and then working together to create something special. I’ve reading a lot of your posts and emails over the past month and have to say they hit home in so many ways! I am presently in marriage counseling with my wife and it is not working as well as I had hoped. I really wish we could sit down and read these together and learn from them, once and for all. But there is a piece of me that believes our marriage has reached its limits. It feels like we’ve been traveling on separate roads for so long, it’s so hard to navigate our way back to each other. I still have hope, but I just wish we had address our disagreements sooner. So for anyone who still has hope in a troubled relationship, read, learn and listen. And most of all remember why you fell in love… and get your relationship back on track sooner rather than later. Stay strong, Andy. You are bringing the right attitude to your present relationship struggles. Stick with the counseling. Give it a chance. Be patient with your wife and yourself. If a year from now (or from when you started counseling) you see no progress at all, then, and only then, might there be a reason to look at other options. Wow! Powerful stuff. And it totally makes sense on paper, but deep down when one side can’t let go of the past, it doesn’t matter how much the other follows these guidelines. It takes two to tango, but only one to walk out of the room. When I read this I think of my parents and grandparents who knew these rules. Sadly, it’s less on the mind of my generation. Very good advice! Me and my girlfriend also disagree sometimes, but we’re doing some of these things well already and are getting better and better at it. For example my girlfriend loves vegan food, so sometimes I make something vegan just for her to be happy, even though I don’t particularly eat a lot of vegan food myself! You’re on the right track, Niklas. Way to go! Marc, if you tried all the above and it is still not working, would you blame it on compatibility? Queen E, like I mentioned to Andy above, I believe lots of effort should be put into repairing a broken relationship — give it a chance. But, with that said, this is your life. You may not be able to control all the things a truly toxic relationship will do to you, but you can decide not to be reduced by it in the long run. You can decide not to let another person’s actions and opinions continuously invade your heart and mind. And above all, you can decide whom to walk beside into tomorrow, and whom to leave behind today. In a perfect world we would always be able to fix our broken relationships, but as you know the world isn’t perfect. Put in the effort and do what you can to keep things intact, but don’t be afraid to let go and do what’s right for YOU when you absolutely must. I am SOOOO looking forward to meeting the two of you this Saturday at your workshop in Jupiter, Florida. Your words of wisdom have helped me grow and improve over the years. As a marriage survivor of 30 years and counting I notice one thing missing from your list.. A good sense of Humor helps! Every once in a while you need to take a step back … and laugh! For those curious about what we’re talking about, here’s the event info. My husband and I have been married for 10 years and have not had more than 90 days of peace in our home due to marital discord. We’ve been in couples counseling solidly for 2 years and individual counseling for about 1 year prior to that. I have accepted responsibility for my part in the communication breakdown and made appropriate changes in my behavior and my responses to situations. I also simply don’t ask for what I need anymore, preferring to take care of myself as opposed to relying on him. He accepts responsibility for his part, says he will make changes, but when uncomfortable issues come up – even minor ones – he reverts to old communication patterns that are hurtful and not solution-oriented or even respectful. I have withdrawn emotionally from the marriage as a method of self-preservation (prior to counseling, I was depressed for a couple of years – so glad to be stronger now!) I care for my husband, but I cannot say that I love him. I am respectful and helpful and fulfill my responsibilities, but I make no apologies anymore nor do I feel guilty about taking care of myself and my emotional needs on a regular basis. To this he feels rejected and takes offense when I announce I need a little alone time after a hard day of work. Even at the point his tantrum is about to start, no gentle reminder of the multiple tools given to us by the counselor can slow down what comes next which is usually ugly, derogatory and hurtful. If he manages to hold himself together, he simply stores it up and then angrily refers to multiple situations where he felt grieved during the next time he feels the need to lash out. So, it does take two to make a mess. And it take two willing, mature people to fix the messes. One person cannot make all the adjustments and have the marriage work. And adjustments cannot be made part-time or only some of the time for their to be trust and love in a marriage. I faced the same thing from my husband. I believe Marc and Angel’s point #1 is #1 for a reason. I spent years in marital counseling, never to has my husband taken responsibility for his actions. It erodes ones self esteem because we start to internalize & believe what they say – that we are the “bad” ones. I got very ill as a result. It took a lot to get out of that relationship, but am so much happier being away from that narcissist! Excellent insight, Shella. I couldn’t agree more with your sentiment. Stay strong. The one thing I would add to the list is patience. You alluded to it when you advised Andy to give counseling at least a year before deciding if there was hope for his marriage to continue. Sometimes, when we read a list of good rules for positive change, we tend to think that there will be immediate improvement in our situation, no matter the area, health, attitude, etc. Each partner in a relationship has their own pace in their ability and motivation to change behavior. We need to be patient with ourselves as well as our partner because we all have stumbling blocks, perhaps from past experience that makes us unwilling to be vulnerable, bad communication habits learned in our family of origin, and any of a number of reasons. Another thing I’ve learned is that even one person making changes changes the relationship. Although it’s best if both partners are trying to change, one person changing creates a new dynamic, and the other person is less likely to, if not actually prevented from, respond(ing) in their habitual ways. And, unless your partner is immune to receiving kindness and respect from others, everyone responds positively to being treated “right”. I am very thankful that I stumbled over your website. Your newsletters are the highlight of my inbox. Nanette, I love the idea of setting a great example, and changing the dynamic of a relationship by expanding your own identity (personal growth). When relationships are going fairly well, but just suffering from a little stagnation (same old routine, etc. ), this is a great way to reinvigorate things. I look forward to learning how to be better and do better for myself and my partner. Lorraine, I’m so glad we were able to assist you on your journey. Sounds like you’ve really improved your emotional strength in your new relationship. Another fantastic blog post, Marc. And the best one I’ve ever read on how to get along, fight fairly and focus on resolution. Every point is so spot on. I love the advice you shared from your grandmother. I can get better at everything you listed. Thanks so much. Sometimes we simply don’t have to say everything that’s on our mind. After all, it’s not like every thought we have is earth shattering. Even more so when we know that it would upset our spouse/significant other. My husband and I disagree about the 2nd amendment, but I don’t push it in his face all the time. As wiser people have said in the past: I’d rather have a relationship then be right, or something like that. With love from almost divorced after 3 years to about to celebrate our 5th anniversary! And expecting a lifetime more! Excellent insight, Nate. No doubt about it… not all marriage counselors (or any counselor/doctor for that matter) are right for your particular circumstances. If you feel friction, always get a second opinion. I am struggeling with the thought and feeling that I have hit a deal-breaker, but I don´t know. Me and my partner anre very different in almost eveything but we have grown together and I have learnt to much from him . I honestly think his influence has made me a better version of myself. He quiets all the thoughts in my mind. But now they are at full speed. We had a diskussion about humanity that was “inspired” by the migrationcatastrophy that is currently taking place in Europe. The differences in our political beliefs, I can handle and accept, but I´m panicking about some of the things he said when it comes to compassion and humanity. I think that a simple prescription is this: treat your partner like your very best friend and it’ s hard to go wrong. When a conflict or a disagreement arises, act “as if” you”re dealing with your very best friend. This alone will completely change the dynamic, because we all know that with our ‘besty’ there are lines which cannot be crossed; there are unspoken rules which cannot be broken without risking the entire friend relationship. If men and women could get this small part right, it would go a long way towards healing relationships of all kinds between differing genders.